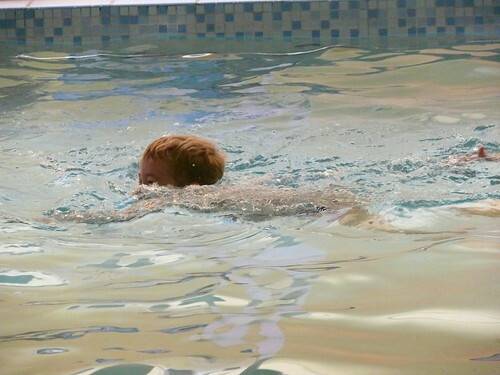 Nathan’s swimming is getting better and better – the new class is doing wonders for his confidence and I’m really enjoying swimming with him too. As you can see from the picture above, he can free swim a little now. I wouldn’t want to throw him in a pool (he does struggle to keep his head above the water fully for a sustained period) but he is a little star and working really hard. The new teacher makes him enjoy it so much more. This is a jump in (he’s made the splash! ), something he was getting increasingly reluctant to do at the previous class. He doesn’t like water on his face, but the momentum of the fun, and the fact he and I are tying the swimming to his current favourite TV show, Octonauts, really helps! It looks like we may be able to avoid goggles for the moment. I’m only wearing them in his class as I’ve kept my contact lenses in, and don’t want them to be swept away in splash. All in all, I’m really happy that he’s doing so well, and Jill deserves a mention for the excellent photos that she’s been taking. I think she’s outdone my last four years in the two above! 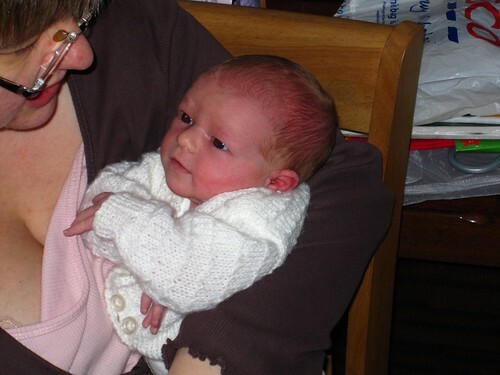 Finally, for those of you who are looking for pictures of Aidan, here is a gratuitous baby shot which has nothing to do with the blog post here! Okay, so I don’t get lynched. Aidan and Jill are both doing well. 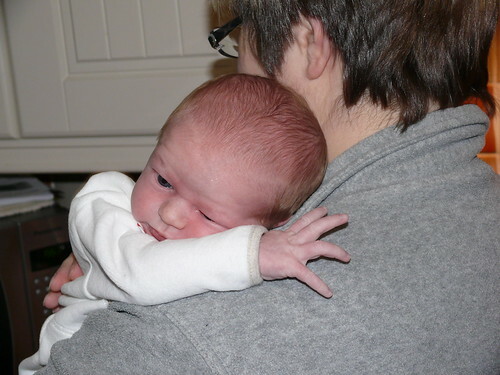 He went from 6lbs 15oz to 7lbs 8oz in the first two weeks, which impressed the midwife and health visitor. They both survived the refit of our bedroom this week, and seem to be getting on well! 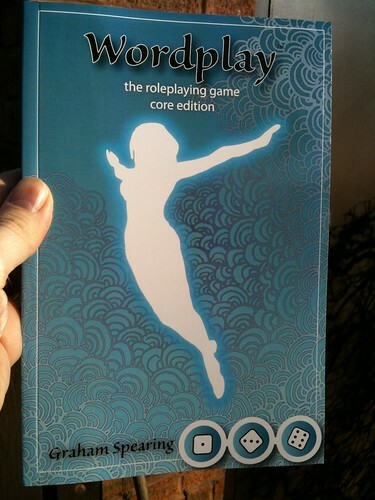 Over the last few years, I’ve been quite heavily involved in the development of Wordplay, Graham Spearing’s excellent multi-genre roleplaying game. I used the first edition as a way to learn how to use Adobe InDesign CS4, and was very proud of it. The original core book was withdrawn from sale when Graham was offered a deal to publish it by a bigger publisher, but unfortunately it fell through after a year of inactivity. The torch was (meanwhile) carried by Newt Newport of d101 Games, who put the original big book version into print with four settings in it. He’s also got a line of support coming through at the moment. Buy some of his books, you’ll like them! Anyway, the rights reverted to Graham, and we’ve taken the opportunity to update the text to reflect further playtests and tweaks done for the now-cancelled edition. 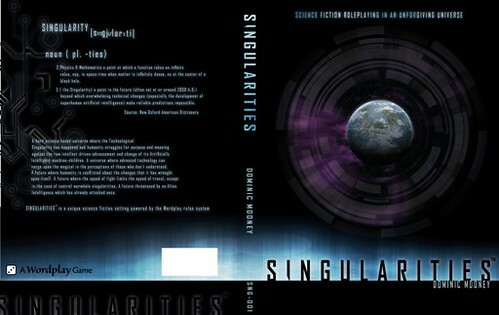 The cover was also completely refreshed, with an excellent design by Steff Worthington. The copy above is the proof, which only took 2 days to come to us from Lulu which was very impressive. A few minor tweaks needed (that’s why you proof) and it’ll be back on sale, which is great news. Wordplay is the engine I am using for the Singularities RPG. Jedi Master or Sith Lord? 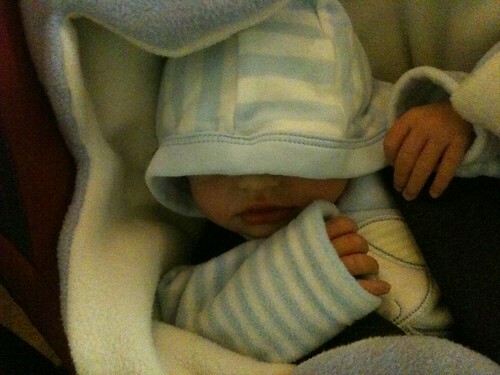 Aidan was hiding in his hood earlier this week and had a touch of the Force about him. But is he a Jedi Master or a Sith Lord? I guess it really depends how hungry he is! Yes, if you click through you’ll find plenty more pictures! Reality crashes in - Vignettes. This is less of a coherent entry, more a set of vignettes on life this last week! Tuesday morning I had the joy of the Part A NEBOSH Diploma exam. This relates to half of the course (3 full weeks) and covers health & safety law and management systems. Pretty challenging on 2.5 hours sleep (both Nathan and Aidan to blame) but I'm pretty certain that I passed. A couple of the questions were gifts, as they were close to stuff I do at work, but I'll have to wait to mid-April to find out. Wednesday was back-to-work day; fortunately, my team had things pretty much in hand, but after the best part of 3 weeks out of the loop, a lot of time got spent talking to people and catching up, plus being asked about Aidan and the exam! 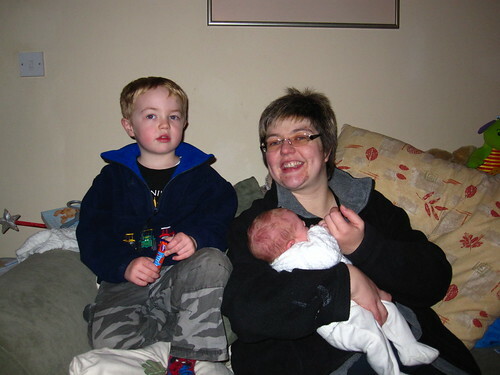 Jill and I both went to Nursery together on two nights this week to collect Nathan, and took Aidan. Partly as a surprise to Nathan, partly to give Jill some time out of the house. There was much cooing over Aidan by staff and kids. Nathan is loving being back, and spent his first day with his friends mostly holding hands and playing with the little girl who has been his best friend all the way through nursery. I think there's potential heartbreak there as they're going to different schools in September! 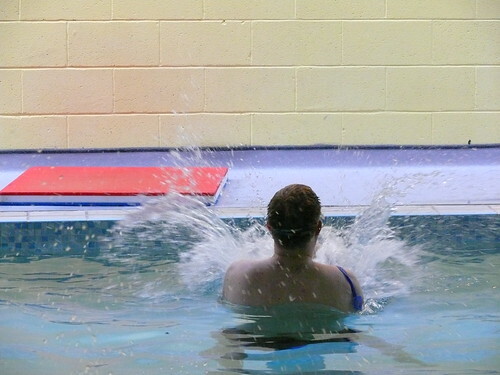 Saturday was Nathan's first swimming session with Water Babies for a long time and he had to put up with me for perhaps the third time in nearly 4 years. We both had a great time; although officially the same level as the previous class that he was doing with a different teacher it's clear that he was not being taught correctly and chunks of things that should have been being covered weren't. We'd suspected this when we had a reserve teacher a few times, but it was confirmed in the session. It was much better and we should have this level for the whole of his last ten weeks. Nathan was a little trooper and got stuck in even though there was much more splashing than he was used too. He's never been a big fan of this. Aidan is being a little champion; he had one night and day when all he wanted to do was feed, which was hard on Jill especially, but generally he's wanting bigger gaps between feeds than Nathan did. He's already changed facially, and is really long and lean. The long legs present a challenge, as many sleep suits assume tubby babies with short legs! Nathan’s being a sweetie and trying to help us as much as possible, even with nappies! Been quiet the last few days due to tiredness and the joy of the exam on Tuesday, but wanted to share this one picture with you. Of course, there are more on the Flickr feed (and some further ones I’ll add tomorrow) but this lovely picture encapsulates Nathan’s response to meeting Aidan for the first time. He was absolutely delightful and loves holding and helping with him. Family meet Aidan. Aidan meet the Family. We've just had a lovely, but tiring day. It's very much been a 'meet the family' day for Aidan, although – in reality – I guess that it really was the other way around. 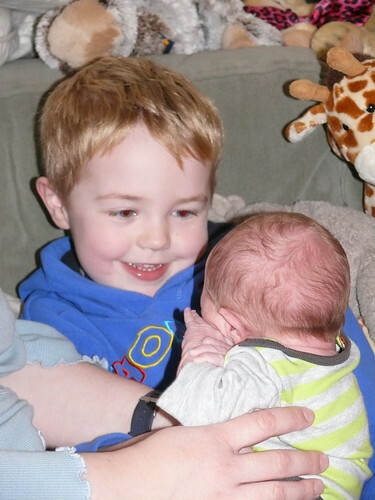 My mum and dad brought Nathan home, and he was an absolutely delight, so excited and charmed by his little brother. I'll share some photos tomorrow to help you visualise this when I have sometime to get things organised properly. He's put a spurt on in height over the last few days too, and looks very much the big brother. He also insists that people call Aidan ‘Aidan Sydney’, then gives me a stare when I call him ‘Nathan Vincent’ back! Jill's mum and dad, and her sister and sister's fiancé came over too, so we had a very full house. Not feeling up to cooking something, the Wetherby Whaler (local fish and chip shop) got a shipping order for 9 fish, 7 chips and 3 mushy peas. Fortunately, they weren't too busy. I think that everyone had a good time - Aidan had plenty of cuddles and Nathan made sure he remained at the heart of things. The house is strangely empty now everyone has headed off, and Jill, Nathan and Aidan have gone to bed. Just me and the cat downstairs. I'm shattered, but I need to do an hour or two of revision for Tuesday's NEBOSH Diploma Exam as today will have been a wash out from that perspective otherwise, and I want Sunday and Monday to focus on past questions and law, both statute and key cases. So proper coffee has been made and I've plugged in my iPod with Goldfrapp's 'Seventh Tree' on. Hopefully chilled enough to focus me, but not to send me hyper so I can't sleep. Just a short update tonight to say that Jill and Aidan were discharged from the hospital today, and we’re home. Nathan isn’t due back with us until the weekend, when both sets of Grandparents plan to visit. We’ve used today (and tomorrow) to start on a routine. Being on our own is good for getting the eat/sleep patterns right a la The Baby Whisperer, which is Jill’s practical guide. 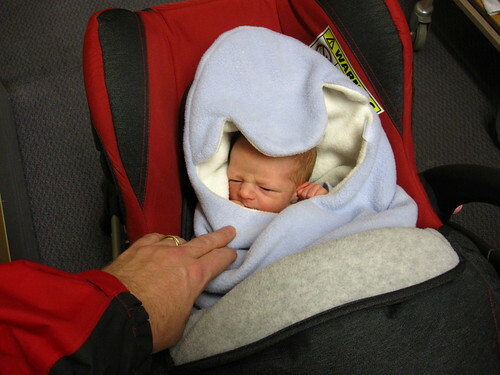 Aidan grumbled nearly as much as Nathan when we bundled him into the car seat ready to go home. Fortunately, I’d done my homework before I got to the hospital and practiced putting the seat in the car. This was nearly undermined by the idiot Mercedes SLK driver who had parked into our space to avoid an SUV, which meant it was a tight squeeze getting Aidan in. He did complain at this new environment until a little music and the vibration and road noise sent him to sleep. That and his full tummy with Jill’s milk that’s come on now. It was a bit hairy getting to the hospital in the first place - there’d been a smash on the main road from Wetherby to Harrogate, and when I diverted to a back route the level crossing had failed down in position so it was another detour to Knaresborough to turn back to Harrogate and the hospital. However, I got there without any more trouble, and only 30 minutes late. Both Aidan and Jill have been sleeping well today plus feeding seems to be going better than Nathan at the same age. I’ve managed to get back on the horse with revision and have just finished the first of three weeks worth of notes that I need to go through by next Monday night, as I have the exam on Tuesday. As ever, the Flickr set has been updated. Only a few extra today. Just a quick update to say that Aidan and Jill are both doing well, and may be able to come home tomorrow. I’ve uploaded a few more pictures to Flickr. As promised Nathan’s fourth birthday pictures are here on Flickr. 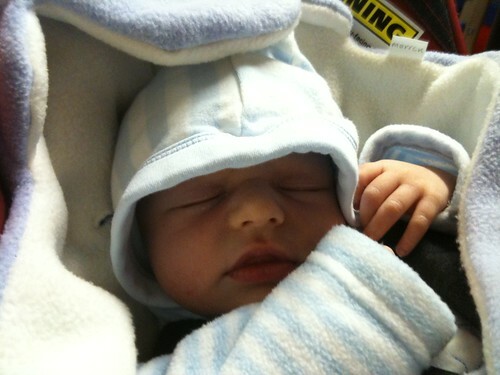 We’re really pleased to announce the birth of our second child, another son, Aidan Sydney Mooney. 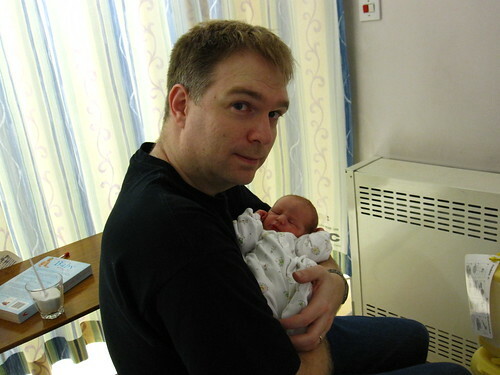 He was born today, 11/1/11, at 17:14 at Harrogate Hospital, weighing 6lb and 15 oz (or 3.14kg). Both Aidan and Jill are doing well. His second name comes from my maternal grandfather. I have posted some pictures on our Flickr site, which will be updated as time goes on. Well, whatever happens, by the 11/1/11 Jill and I should be parents again for the second time, as we've now been given a date for the c-section should nothing happen naturally. Nathan is now at my parents after a lovely birthday which has gone on and on as a result of finding some misplaced presents (!) and we await developments. 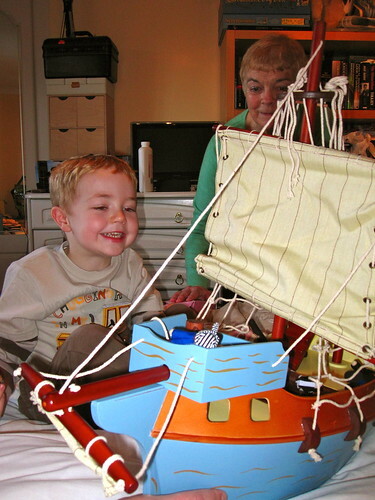 We spent his fourth birthday with friends and family, starting off with some presents at home (particularly a Pirate ship) and then going on the Crazy Tykes, the local children's indoor play area. Rather than have a full birthday, Nathan just met up with two of the kids who are his friends, Calum and Joe, and they had great fun running around and climbing and sliding, followed up by fish fingers, hoops and chips and plenty of juice. He'll have a more formal party once we're clear of new baby changes. We went home, meeting up with Nathan's Aunty Paula and Uncle Mark, and his Godfather Phill, for more party food, presents and cake. The cake was a lovely chocolate one (why did Nathan want chocolate not sponge?!) with a Toy Story 3 design on top. We also had a chat to his Nanna and Grandad through the magic of Skype and video cameras. All in all, I think Nathan had a great day; maybe not as memorable as the tractor party last year – as he got to ride on one that time – but still a good day. (I’ll update this with some pictures once I get a chance to process them onto Flickr). Some significant changes, the first of which is that the site has migrated from the old Pipex URL to an new address http://www.deltapavonis.net/ as part of my slow move away from TalkTalk as an ISP. Email addresses etc will also change, but I’ll update you more when that happens. The site has been rebuilt using Rapidweaver 5, which really seems to do more of the same, but nicely. I’ve merged the media section and the ‘other games section’ into the main blog to simplify further, plus changed the Flickr page to point straight at my photostream. There’s also some back end stuff related to PHP which should make site updates swifter for me. Finally, I’ve changed the theme for the site to refresh it after 4 or more years the same. Enjoy. I hope you find the new site pleasant! We still await the arrival of Nathan’s sibling. Just a quick update to wish you all a happy, fruitful and prosperous New Year in 2011. We're waiting with baited breath for the arrival of Baby #2, which is due today according the medics, but no real sign that it's coming today yet. As I type this, Nathan and I are hiding downstairs on the sofa, watching CBeebies while Jill tries to catch up on sleep. She had a bad night due to a combination of contractions, discomfort from the big bump, my coughing and Nathan waking up. I was sent to the sofa downstairs due to the cough, so got a little more sleep than she did. My parents came over for Christmas, and are on standby for looking after Nathan when the Baby arrives, albeit from Cheshire now as they went home two days ago. I'm two weeks into an awful upper respiratory tract infection which wiped me out the first week. Fighting it off with a combination of patent remedies and antibiotics which the Doctor gave me as a just in case due to the proximity of the birth. The cough has been the worst thing this week and came back with a vengeance last night. I'm hoping that it's because I'm at the end of the infection. Nathan has had a great time - with lots of presents and attention. 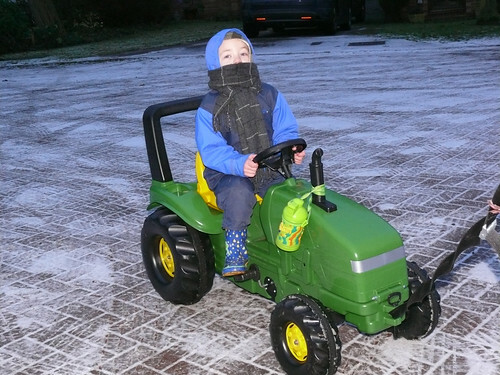 Favourites include Buzz and Woody toys, and a John Deere Forage Harvester. 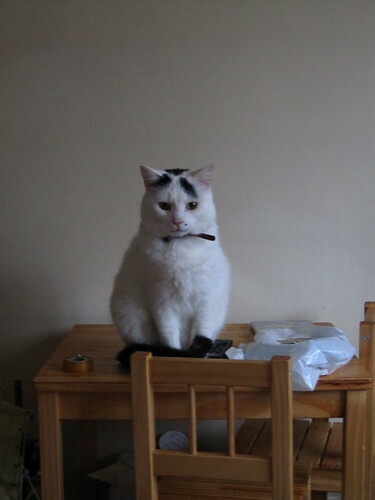 He was also ill, but has bounced back well as kids his age do. I can't believe that he's nearly four now. The conversations can be quite a challenge now and never cease to amaze. One of his nursery teachers described him as 'fiercely independent' which is very apt. He likes to do things himself and take charge. So, that's a brief update from us. We hope you've had a great Christmas and New Year, and that 2011 brings you prosperity and good fortune.